So, in our East Coast Adventure we went from DC to Philly. We were only in the city 24 hours but we managed to do all of the big things while hanging out with friends and it was loverly. We went directly from the train to a cab to my friend Zoe’s apartment where we immediately left to go get Philly cheesesteaks. Because how could we not? After deliciously greasy cheesesteaks we trekked over to see the Liberty Bell and Independence Hall. Seriously, we hit our history quota like no other on this trip. It was fun to see the bell and to take the small tour of Independence Hall (despite the guide that talked on and on and on). 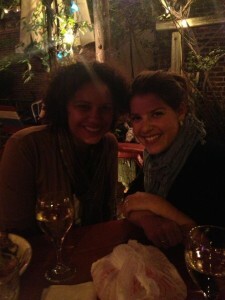 Our evening was spent at a restaurant that was featured on Diners, Dives & Drive-Ins and was DELICIOUS. And it was so nice outside we even sat outside (huzzah!). It was so fun to chat and catch up with Zoe and Matt and just, yes (cannot wait for them to visit in December!). The rest of the night was spent drinking wine and watching bad TV at their place and yes, the best. The next day we had an amazing breakfast before getting our history on even more. 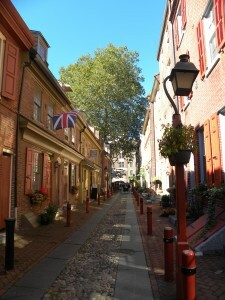 We visited the oldest residential street in the US followed by a tour of Betsy Ross’s house. See? History! We had the best weather to explore and hang out and it was great. Before we knew it it was time to head to the bus stop for our ride to NY! And onward our adventure went. Thanks Philly, you were swell. Have you been to Philly? 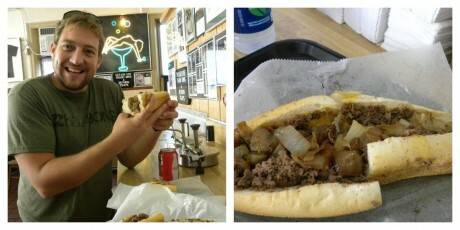 Had a cheesesteak? What do you think? I have been to Philly; it was ages ago, but I went to the Liberty Bell as well. 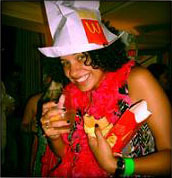 I should probably unearth that photo some where and then be immediately embarrassed by my fashion sense at the time. I am pretty sure I had a cheesesteak, too, but it was so long ago (sophomore year in high school) I honestly don’t remember! It sounds delicious right now, though. Even though it’s not even 10am here. Funny, because I was just on Philly in August for a day! We had a wedding to attend a bit north of the city, so we decided to take a day there, since neither of us had really spent much time there. One of my good friends lives there, so we met her for brunch, and then did all the same touristy stuff. I loved the Betsy Ross House! We also went to the US Mint, among other places! Don’t forget, you also got to try a TASTYKAKE! Its 7:54am over here and I already want a Philly Cheese Steak now. So there’s that..
Philly is another one of those great East Coast cities I haven’t seen much one. It was a quick stop on a road trip I took a few years ago and while we did take in a bit of history, I’d love to go back and take in a lot more. Previous post: A Monumental D.C. Expedition. Next post: They were not alone.